People have long thought of Cuba as a last bastion resisting the clutches of Coca Cola, McDonald’s and rampant capitalism. But now the US is moving in, tourists are flocking to the island republic to experience it before the rot sets in. According to AP, booking figures showed a spike of 187 percent in February and a whopping 250 percent in March, in the wake of the United States in December announcing a warming of ties with its historic rival and world-famous communist stronghold. "Cuba has a very authentic atmosphere which you see nowhere else in the world," Gay Ben Aharon from Israel told AP in Havana. "I wanted to see it before the American world ... but also the modern Western world comes here." The country saw a 16-percent increase in visitors in January this year, compared to the same period in 2014. 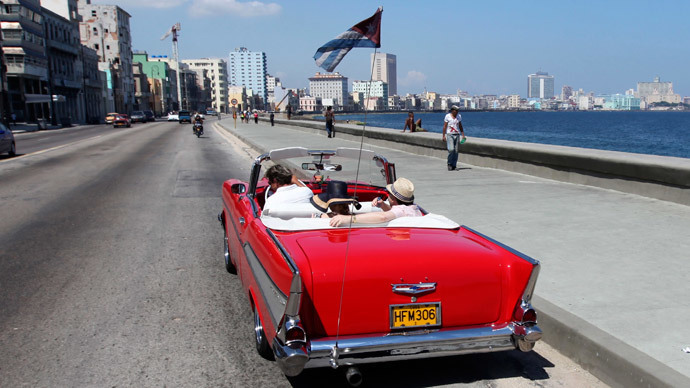 The $2.6-billion tourist industry remains a key driver of the Cuban economy. According to AP, last year’s three million visitors was a record. Of these, 600,000 came from the US. Tens of thousands also come on a number of educational and cultural exchange programs. Another sizeable portion of tourists is thought to have been beating a path there for years via third destinations, in attempts to avoid travel restrictions. If all restrictions on travel were lifted, Cuban authorities foresee the above 600,000 turning into 1.5 million in no time. Consequently, Cuban profits would soar by an additional $2 billion. To a foreigner’s eye, Cuba is exotic for its beautiful, ramshackle and rustic architecture and landscape, but many locals just think the dilapidation requires renovation and repair. Also imported goods and other novelties remain way beyond the reach of most locals’ pockets. While they may ideally want their country to retain its authentic character, many Cubans believe economic development is a top priority. However, the influx of tourism is so high that many visitors are struggling to even find accommodation. A tourist from Canada told AP he predicts demand will continue to outstrip capacity. "I see a lot of construction, very nice restorations — that's very good," Rogelio Guavin said. "But there won't be enough hotels. There won't be enough restaurants. There won't be enough services to accommodate the Americans who will come like rats on a ship." Since Raul Castro officially took office in 2008, Cuba has been sprucing itself up considerably. Fidel’s younger brother has pumped $207 million into the airport alone, which is being expanded with a Brazilian conglomerate at the helm. Also, while previously only charter companies flew to Cuba, several US airlines are considering launching regular flights. "That's why I think it's going to be really hard for you to find a McDonald's or a Starbucks right around the corner,” he said with optimism.